There is excellent news on dealing with malaria in Africa. A report in Nature from a number of public health statisticians has got a handle on how the fight is progressing. This is no mean feat as public health records in many of the most affected African countries, are, well, sketchy. The team, lead by Samir Bhatt (at least in the author list) found a way around this. Rather than looking at mortality, they looked at the incidence of plasmodium falciparum infection in children between the ages of 2 and 10 across the continent using a set of reliable surveys. These were then used to infer (think of how global temperature anomalies are inferred from individual stations). The figure below shows the percentage of the population infected across the continent in 2000 (red) and in 2015 (blue). The major reduction in high percentages of infection is especially heartening, because the two reservoirs of plasmodium falciparum infection are mosquitos and people. The protozoan parasite ping-pongs between the two. 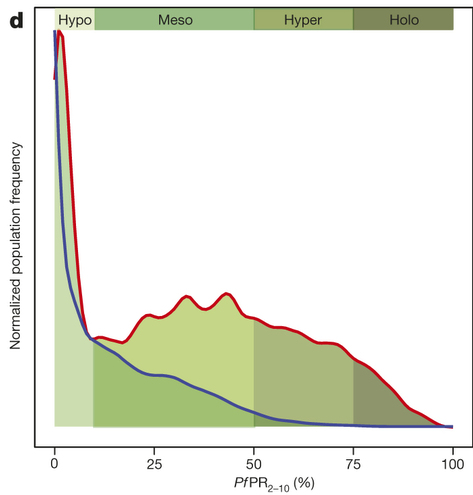 Typically (think Walter Reed and Yellow Fever) diseases like malaria are fought by decreasing the mosquito reservoir, but if fewer people in an area are infected, the human reservoir is shrunk and the probability of the disease spreading following mosquito bites from an infected individual is decreased. Since 2000, under the UN Millenium Development Goals, three methods of malaria suppression have been deployed, pyrethroid treated bed nets (ITN), artemisinin combination therapy (ACT), and indoor residual spraying with DDT (IRS). Bhatt, et al find that the bed nets have had the greatest effect to date. 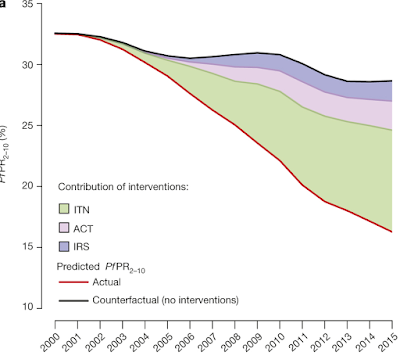 Changes in prevalence largely followed patterns of increasing ITN coverage, and ITNs were by far the most important intervention across Africa, accounting for an estimated 68 (62–72)% of the declines in PfPR seen by 2015 (Fig. 2a). We estimated ACT and IRS contributed 19 (15–24)% and 13 (11–16)% respectively, although these interventions had larger proportional contributions where their coverage was high (Extended Data Fig. 4). 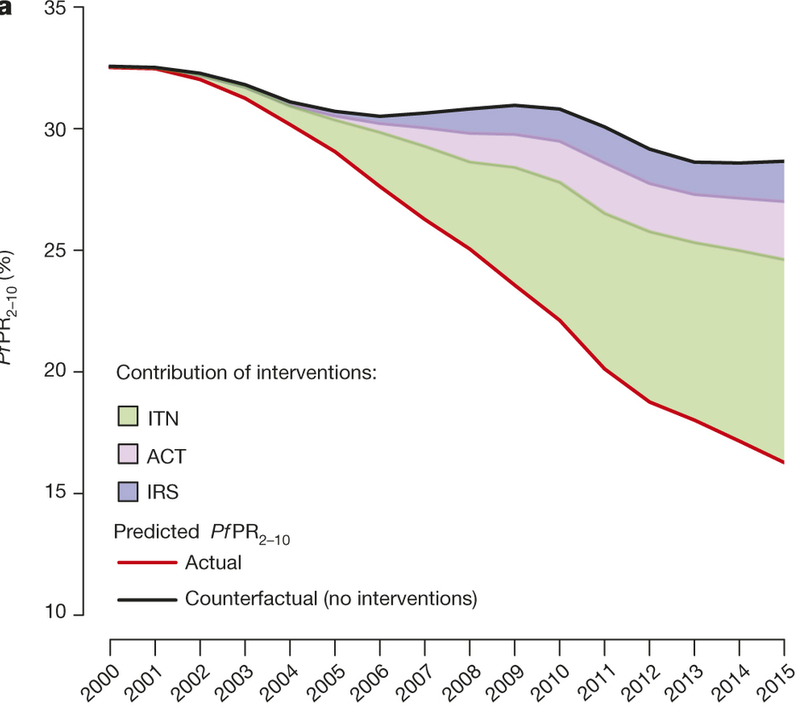 It is important to emphasize that these proportional contributions do not necessarily reflect the comparative effectiveness of different intervention strategies but, rather, are driven primarily by how early and at what scale the different interventions were deployed. There is concern about each of these tools losing effectiveness. ACT resistance has emerged in Southeast Asia for example and there is a major effort to limit it and the mosquitos are evolving in ways to decrease the effectiveness of ITNs and IRS. New tools are being developed, for example vaccines, and using bioengineering aka Genetic Modification to create mosquitos that cannot support plasmodium falciparum. A major need is development of an inexpensive and accurate diagnosis kit that can be deployed into all areas. Lack of rapid diagnosis leads to underemployment (people don't get treated and are mosquito targets) or overemployment of ACTs (leads to development of resistance in the plasmodium). Between 2000 and 2015, the substantial expansion of malaria interventions led to a 58 per cent decline in malaria mortality rates globally. Since 2000, over 6.2 million deaths from malaria were averted, primarily in children under five years of age in Sub-Saharan Africa. Due to increased funding, more children are sleeping under insecticide-treated bed nets in sub-Saharan Africa. The next time somebunny starts frothing about Agenda 21, the UN and Maurice Strong ask them what they have against successfully fighting malaria. God bless DDT & pyrethrin impregnated bed nets ! That is to say, God bless bednets impregnated with DDT & pyrethrin. This should make global warming more attractive for another 1 tenth of a degree C. We could be in positive territory for another 4 decades. Fernando, if your conclusion is truly representative of the analytical capacity of your colleagues, I weep for the profession that you boast about so frequently.